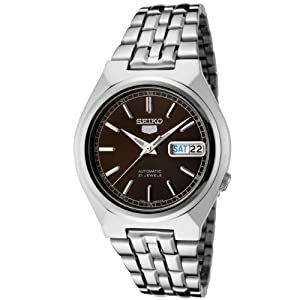 This Seiko 5 has a stainless steel case and band that combine brushed and polished metal for a visually interesting effect. The dark brown face has a rich appeal that you just can't get with black. Silver-toned hands and hour markers complete the look. The calendar, in the 3 position, displays the day and date. Water resistance is a lowly 30 meters (99 feet), so it's best not to put it under water. The crown is placed in the 4 position for added comfort. This is a great watch for everyday use. It's an automatic movement that gets wound by arm movement, but it doesn't have much reserve power. It's best to wear it every day or you'll have to keep resetting the time. It's hard to go wrong with this one, especially when you consider the price.